When I first saw the catalog I absolutely loved the Everything Eleanore stamp set! So of course I had to use it at the first Make and Take possible. This is the last card that we made at the July Make and Take. I started off this card by cutting a piece of Whisper White card stock 5-1/2” x 8-1/2” and scored it at 4-1/4”. Next I cut a piece of Whisper White card stock 3-5/8” x 4-7/8”. I stamped the swirl from Everything Eleanore in Tempting Turquoise ink all over the Whisper White card stock. I adhered this onto a 3-3/4” x 5” piece of Basic Black card stock. Then I adhered this panel onto the card front. I wanted to add some texture to the bottom, so I cut a piece of Basic Black card stock 2” x 4-7/8” and ran it through the Big Shot in the Fancy Fan embossing folder and adhered it onto the bottom of the stamped Whisper White panel. You can see that my cutting wasn’t exactly perfect, because I had to center the textured card stock on the White instead of it going all the way across. 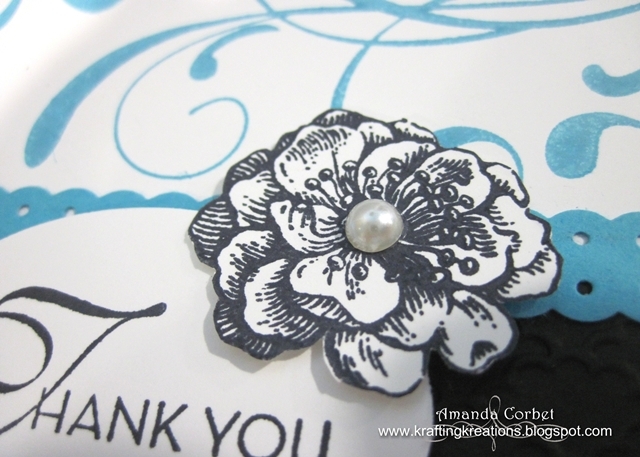 I used the Dotted Scallop Ribbon punch on a scrap of Tempting Turquoise card stock and trimmed it to 4-7/8” long before adhering it onto the card front with 2-Way Glue Pen to cover the edge of the Basic Black card stock. Then I stamped the greeting from Lovely and Lacy onto a scrap of Whisper White card stock in Black Stazon ink. I punched out the greeting with the XL Oval Punch and adhered the oval into the center of the card with a couple Stampin’ Dimensionals. I stamped the flower from Everything Eleanore onto a scrap of Whisper White card stock, cut it out with Paper Snips, and adhered the flower onto the card front with a Stampin’ Dimensional. Just to give the card a little bit of sparkle I added a Pearl into the center of the flower. I really love the black and white with the pop of color!